Robert Merton Solow, GCIH (/ˈsoʊloʊ/; born August 23, 1924), is an American economist, particularly known for his work on the theory of economic growth that culminated in the exogenous growth model named after him. He is currently Emeritus Institute Professor of Economics at the Massachusetts Institute of Technology, where he has been a professor since 1949. 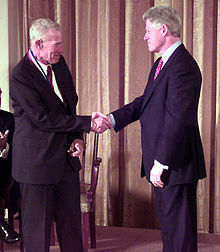 He was awarded the John Bates Clark Medal in 1961, the Nobel Memorial Prize in Economic Sciences in 1987, and the Presidential Medal of Freedom in 2014. Four of his PhD students, George Akerlof, Joseph Stiglitz, Peter Diamond and William Nordhaus later received Nobel Memorial Prizes in Economic Sciences in their own right. Solow is the founder of the Cournot Foundation and the Cournot Centre. After the death of his colleague Franco Modigliani, Solow accepted an appointment as new Chairman of the I.S.E.O Institute, an Italian nonprofit cultural association which organizes international conferences and summer schools. He is a trustee of the Economists for Peace and Security. Solow was one of the signees of a 2018 amici curiae brief that expressed support for Harvard University in the Students for Fair Admissions v. Harvard lawsuit. Other signees of the brief include Alan B. Krueger, George A. Akerlof, Janet Yellen, Cecilia Rouse, as well as numerous others. Solow's model of economic growth, often known as the Solow-Swan neo-classical growth model as the model was independently discovered by Trevor W. Swan and published in "The Economic Record" in 1956, allows the determinants of economic growth to be separated into increases in inputs (labour and capital) and technical progress. The reason these models are called "exogenous" growth models is the saving rate is taken to be exogenously given. Subsequent work derives savings behavior from an inter-temporal utility-maximizing framework. Using his model, Solow (1957) calculated that about four-fifths of the growth in US output per worker was attributable to technical progress. Since Solow's initial work in the 1950s, many more sophisticated models of economic growth have been proposed, leading to varying conclusions about the causes of economic growth. For example, rather than assuming, as Solow did, that people save at a given constant rate, subsequent work applied a consumer-optimization framework to derive savings behavior endogenously, allowing saving rates to vary at different points in time, depending on income flows, for example. In the 1980s efforts have focused on the role of technological progress in the economy, leading to the development of endogenous growth theory (or new growth theory). Today, economists use Solow's sources-of-growth accounting to estimate the separate effects on economic growth of technological change, capital, and labor. In the early 1960s the Massachusetts Institute of Technology (MIT) was the native land of the "growthmen." Its leading light, Paul Samuelson, had published a pathbreaking undergraduate textbook, Economics: An Introductory Analysis. In the sixth edition of Economics, Samuelson (1964) added a "new chapter on the theory of growth." Samuelson drew on the work on growth theory of his younger colleague Robert Solow (1956)—an indication that growthmanship was taking an analytical turn. The MIT economists were thus growthmen in two senses: in seeing growth as an absolutely central policy imperative and in seeing the theory of growth as a focus for economic research. What the MIT growthmen added was a distinctive style of analysis that made it easier to address the dominant policy concerns in tractable formal models. Solow's (1956) model was the perfect exemplar of the MIT style. It provided the central framework for the subsequent developments in growth theory and secured MIT as the center of the universe in the golden age of growth theory in the 1960s (Boianovsky and Hoover 199–200). Dorfman, Robert; Samuelson, Paul; Solow, Robert M. (1958). Linear programming and economic analysis. New York: McGraw-Hill. Solow, Robert M. (1970-10-15). Growth Theory - An Exposition (1970, second edition 2006). Oxford University Press. ISBN 978-0195012958. Solow, Robert M. (1990). The Labor Market as a Social Institution. Blackwell. ISBN 978-1557860866. Robert Merton Solow (Jan 1952). "On the Structure of Linear Models". Econometrica. 20 (1): 29–46. doi:10.2307/1907805. JSTOR 1907805. Solow, Robert M. (1955). "The Production Function and the Theory of Capital". The Review of Economic Studies: 103–107. Solow, Robert M. (February 1956). "A contribution to the theory of economic growth". Quarterly Journal of Economics. 70 (1): 65–94. doi:10.2307/1884513. JSTOR 1884513. Pdf. Solow, Robert M. (1957). "Technical change and the aggregate production function". Review of Economics and Statistics. 39 (3): 312–20. doi:10.2307/1926047. JSTOR 1926047. Pdf. Solow, Robert M. (May 1974). "The economics of resources or the resources of economics". The American Economic Review, Special Issue: Papers and Proceedings of the Eighty-sixth Annual Meeting of the American Economic Association. 64 (2): 1–14. JSTOR 1816009. Solow, Robert M. (September 1997). "Georgescu-Roegen versus Solow/Stiglitz". Ecological Economics. 22 (3): 267–68. doi:10.1016/S0921-8009(97)00081-5. Solow, Robert M. (November 2003). "Lessons learned from U.S. welfare reform". Prisme. 2. Archived from the original on 2015-05-16. Solow, Robert M. (Spring 2007). "The last 50 years in growth theory and the next 10". Oxford Review of Economic Policy. 23 (1): 3–14. doi:10.1093/oxrep/grm004. ^ Bator, Francis M. (1956). Capital, Growth and Welfare—Theories of Allocation (Ph.D.). Massachusetts Institute of Technology. Retrieved June 29, 2017. ^ Enthoven, Alain C. (1956). Studies in the theory of inflation (Ph.D.). Massachusetts Institute of Technology. Retrieved June 30, 2017. ^ Jones, Ronald Winthrop (1956). Essays in the Theory of International Trade and the Balance of Payments (Ph.D.). Massachusetts Institute of Technology. Retrieved June 30, 2017. ^ Mohring, Herbert D. (1959). The life insurance industry: a study of price policy and its determinants (Ph.D.). Massachusetts Institute of Technology. Retrieved May 26, 2018. ^ Findlay, Ronald Edsel (1960). Essays on Some Theoretical Aspects of Economic Growth (Ph.D.). Massachusetts Institute of Technology. Retrieved June 30, 2017. ^ Perry, George (1961). Aggregate wage determination and the problem of inflation (Ph.D.). Massachusetts Institute of Technology. Retrieved July 4, 2017. ^ Wagner, Harvey M. (1962). Statistical Management of Inventory Systems (Ph.D.). Massachusetts Institute of Technology. Retrieved June 30, 2017. ^ Intriligator, Michael D. (1963). Essays on productivity and savings (PhD thesis). MIT. OCLC 33811859. ^ Sengupta, Arjun Kumar (1963). A study in the constant-elasticity-of-substitution production function (Ph.D.). Massachusetts Institute of Technology. Retrieved July 4, 2017. ^ Akerlof, George A. (1966). Wages and capital (PDF) (Ph.D.). Massachusetts Institute of Technology. Retrieved June 28, 2017. ^ Sheshinski, Eytan (1966). Essays on the theory of production and technical progress (PDF) (Ph.D.). MIT. Retrieved May 26, 2018. ^ Stiglitz, Joseph E. (1966). Studies in the Theory of Economic Growth and Income Distribution (PDF) (Ph.D.). MIT. p. 4. Retrieved June 29, 2017. ^ Weitzman, Martin (1967). Toward a theory of iterative economic planning (Ph.D.). MIT. Retrieved 26 May 2018. ^ Gordon, Robert J. (1967). Problems in the measurement of real investment in the U.S. private economy (Ph.D.). MIT. Retrieved 12 December 2016. ^ Hall, Robert E. (1967). Essays on the Theory of Wealth (Ph.D.). Massachusetts Institute of Technology. Retrieved July 5, 2017. ^ Nordhaus, William Dawbney. (1967). A Theory of Endogenous Technological Change (Ph.D.). Massachusetts Institute of Technology. Retrieved July 1, 2017. ^ Dixit, Avinash K. (1968). Development Planning in a Dual Economy (Ph.D.). Massachusetts Institute of Technology. Retrieved July 1, 2017. ^ Fair, Ray C. (1968). The Short Run Demand for Employment (Ph.D.). Massachusetts Institute of Technology. Retrieved July 1, 2017. ^ Blinder, Alan S. (1971). Towards an Economic Theory of Income Distribution (Ph.D.). Massachusetts Institute of Technology. Retrieved July 1, 2017. ^ Siegel, Jeremy J. (1971). Stability of a Monetary Economy with Inflationary Expectations (PDF) (Ph.D.). Massachusetts Institute of Technology. Retrieved July 5, 2017. ^ Iwai, Katsuhito (1972). Essays on Dynamic Economic Theory - Fisherian Theory of Optimal Capital Accumulation and Keynesian Short-run Disequilibrium Dynamics (Ph.D.). Massachusetts Institute of Technology. Retrieved July 5, 2017. ^ Shavell, Steven Mark (1973). Essays in Economic Theory (Ph.D.). Massachusetts Institute of Technology. Retrieved July 5, 2017. ^ Loury, Glenn Cartman (1976). Essays in the Theory of the Distribution of Income (Ph.D.). Massachusetts Institute of Technology. Retrieved July 7, 2017. ^ Hausman, Jerry (2013), "Hal White: Time at MIT and Early Life Days of Research", in Chen, Xiaohong; Swanson, Norman R., Recent Advances and Future Directions in Causality, Prediction, and Specification Analysis, New York: Springer, pp. 209–218, ISBN 978-1-4614-1652-4. ^ Baldassarri, Mario (1978). Government investment, inflation and growth in a mixed economy : theoretical aspects and empirical evidence of the experience of Italian government corporation investments (Ph.D.). Massachusetts Institute of Technology. Retrieved June 30, 2017. ^ Bean, Charles Richard (1982). Essays in unemployment and economic activity (Ph.D.). Massachusetts Institute of Technology. Retrieved June 30, 2017. ^ "Robert M. Solow | American economist". Encyclopedia Britannica. Retrieved 2017-06-08. 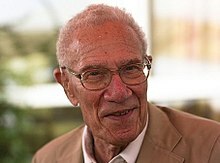 ^ "Prospects for growth: An interview with Robert Solow". McKinsey & Company. September 2014. Retrieved 2017-06-08. ^ "MIT Economics Faculty". Massachusetts Institute of Technology. Retrieved 27 August 2017. ^ "American Economic Association". www.aeaweb.org. Retrieved 2017-06-08. ^ Solow, Robert M. "Robert M. Solow - Biographical". www.nobelprize.org. Retrieved 2017-06-08. ^ Schulman, Kori (2014-11-10). "President Obama Announces the Presidential Medal of Freedom Recipients". whitehouse.gov. Retrieved 2017-06-08. ^ Dieterle, David A (2017). Economics: The Definitive Encyclopedia from Theory to Practice. 4. Greenwood. p. 376. ISBN 978-0313397073. ^ "MIT Libraries' catalog - Barton - Full Catalog - Full Record". library.mit.edu. Retrieved 2018-10-10. ^ Business, Ivana Kottasová, CNN. "Nobel Prize in economics awarded to William Nordhaus and Paul Romer". CNN. Retrieved 2018-10-10. ^ a b c d "Robert M. Solow – Autobiography". Nobelprize.org. 1924-08-23. Retrieved 2010-03-16. ^ "Robert M Solow - Middlesex Massachusetts - Army of the United States". wwii-army.mooseroots.com. Retrieved 2017-06-08. ^ "RePEc Genealogy page for Robert M. Solow". Research Papers in Economics (RePEc). Retrieved 1 November 2014. ^ "Top 5% Authors, as of September 2014: Strength of Students". Research Papers in Economics (RePEc). Retrieved 1 November 2014. ^ a b c d Haines, Joel D.; Sharif, Nawaz M. (2006). "A framework for managing the sophistication of the components of technology for global competition". Competitiveness Review. 16 (2): 106–21. doi:10.1108/cr.2006.16.2.106. ^ Boianovsky, Mauro; Hoover, Kevin D. (2014). "In The Kingdom Of Solovia: The Rise Of Growth Economics At MIT, 1956–70". History of Political Economy. 46: 198–228. doi:10.1215/00182702-2716172. hdl:10419/149695. Greenwood, Jeremy; Krusell, Per; Hercowitz, Zvi (1997). "Long-run Implications of Investment-Specific Technological Progress". American Economic Review. 87: 343–362. Greenwood, Jeremy; Krusell, Per (2007). "Growth Accounting with Investment-Specific Technological Progress: A Discussion of Two Approaches". Journal of Monetary Economics. 54 (4): 1300–1310. doi:10.1016/j.jmoneco.2006.02.008. Jorgenson, Dale W. (1966). "The Embodiment Hypothesis". Journal of Political Economy. 74: 1–17. doi:10.1086/259105. Toye, John (2009). "Solow in the Tropics". History of Political Economy. 41 (1): 221–40. doi:10.1215/00182702-2009-025.